At the fourth session of the Seventh Ecumenical Synod in 787, Saint Peter, Bishop of Nicomedia, in defending the necessity of icon veneration, presented an account attributed to Saint Athanasius the Great about a miracle which occurred in the city of Beirut (Berytus) of Phoenicia. In this city, near the Jewish synagogue, lived a certain Christian. When he moved to another place, he left behind an icon of our Lord Jesus Christ. A Jew, who moved into the house, paid no attention to the icon. Once, his friend noticed the image of Jesus Christ on the wall, and said to the homeowner, “Why do you, a Jew, have an icon in your house?” He then went to the synagogue and reported this transgression of Jewish law. The Jews went to the Bishop of Beirut. 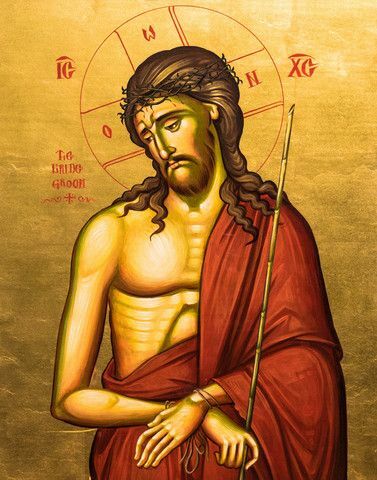 After showing him the wonderworking icon and the blood and water that flowed from it, they told him of their misdeed. The bishop, seeing their sincere repentance, accepted them, catechized them for many days and then baptized them. Then he consecrated the synagogue into a church of our Savior Jesus Christ. At the request of the Jews, he also consecrated other synagogues into churches dedicated to the holy martyrs. There was great joy in that city, not only because many people were healed, but because many were baptized due to the miracles worked by the icon of the Savior. Later in the year 975, Emperor John Tzimiskes (969-976) brought the wonderworking icon of Christ from Beirut to Constantinople, to the court chapel of Christ near the Chalke Gate, where he was supposed to be buried.